You may know from reading my post in November 2018 that partners in the Indian River Lagoon are expanding the Florida Horseshoe Crab Watch citizen science program into Brevard and Indian River counties. The program takes advantage of the beach nesting behavior of horseshoe crabs to collect valuable information. Volunteers walk a known section of beach at predetermined times and count the number of horseshoe crab mating groups observed. A small subset of those crabs counted are collected, tagged with a small numbered disc, and released back into the wild, and information about those crab is documented. Interested volunteers attended trainings in January. They have already started monitoring and surveying at sites in the Indian River Lagoon. The two sites in Brevard County are Kelly Park East in Merritt Island and Parrish Park in Titusville. There are two sites in Indian River County in Sebastian. 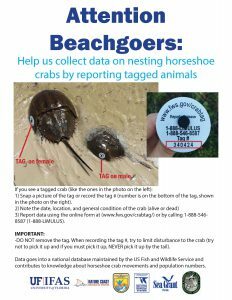 One of the most important parts of the program is the reporting of tagged horseshoe crabs and reappearances on beaches. This is because these reports help track crab movements. It also helps get an idea of the size of the population. It’s important to NOT remove the tag. When recording the tag number, try to limit disturbing the horseshoe crab. Try not to pick the crab up. If you must pick the crab up for some reason, DO NOT pick it up by the tail. Sighting data goes into the national database maintained by the US Fish and Wildlife Service. It contributes to knowledge about horseshoe crab movements and population numbers. For more information about the Florida Horseshoe Crab Watch program and about horseshoe crabs please visit myFWC.com/HorseshoeCrabs. Is any yagging being done in Collier County? When is the best timr of yr to watch for mating crabs? Several yrs ago I was doing daily searches at Tigertail beach/lagoon. Found a good number that I sexed, measured etc. Never knrw where to send tbe data. Any contact person for this area? 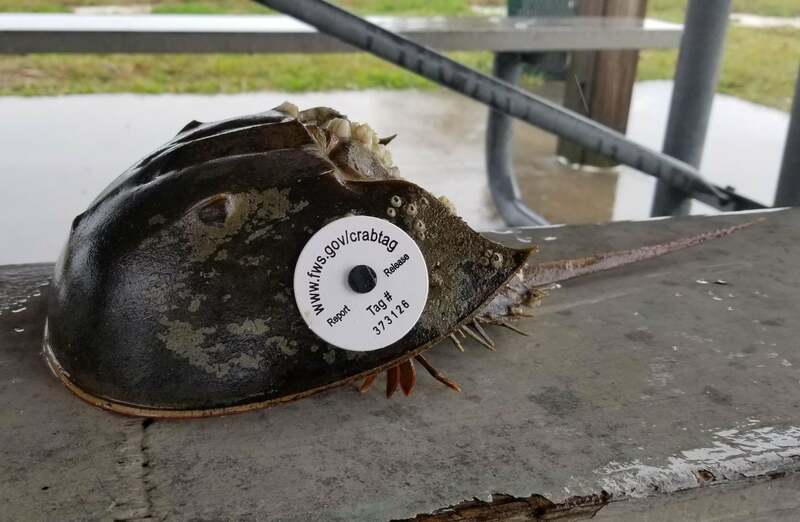 The counties currently involved in the FL Horseshoe Crab Watch Program are Franklin, Taylor, Dixie, Levy, Hernando, Pinellas, Manatee, Martin, Indian River, Brevard, Volusia, and Nassau. There are some counties that will be incorporated in the future including those in Southwest Florida (and Collier county). Here on the East Coast of Florida we see horseshoe crabs nesting between December-May depending on where you are. On the Gulf Coast of Florida they see them nesting in the spring and fall (Feb-May and Aug-Oct). It’s unknown what the nesting time is in southwest Florida. 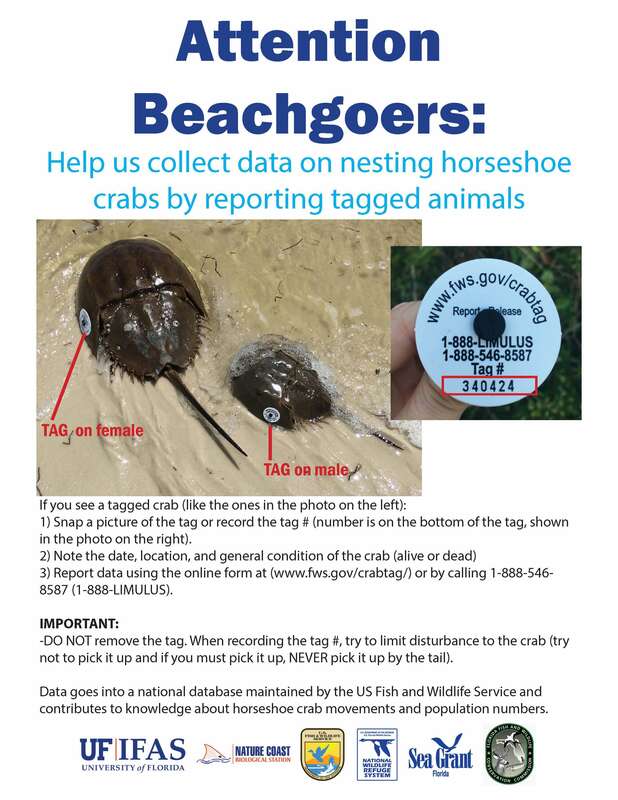 If you ever do see horseshoe crabs please report them to the FWC Wildlife Hotline for horseshoe crabs at this link: https://myfwc.com/research/saltwater/crustaceans/horseshoe-crabs/ (click on Report Your Nesting Horseshoe Crab Sighting). You can also download the free FWC Reporter App and report sightings through your mobile device (https://myfwc.com/news/all-news/sighting-app/).